The Iberostar Grand El Mirador is a deluxe, adult-only, 5-star hotel. Set in the beautiful, ocean-side resort of Costa Adeje, guests can enjoy the beautiful views of the Atlantic ocean and the sands of nearby Playa del Duque beach. Set out as a traditional Spanish village, the hotel exhibits warm, pastel tones, and graceful staircases. Guests are treated to elegant, stylish, and spacious suites, with the option to upgrade to a personal butler service. Suites include a terrace where you can take in the peaceful surroundings of the hotel’s lavish gardens. Spend your days relaxing by the impressive freshwater pool complex, which is spread out over more than an acre. Or spend some time at the spa, which offers a hydrodynamic swimming pool, Turkish bath, and a range of luxury face and body treatments. Come away feeling completely pampered and revitalised. Those who prefer to stay active can enjoy one of the many golf courses or partake in water sports on the beach. 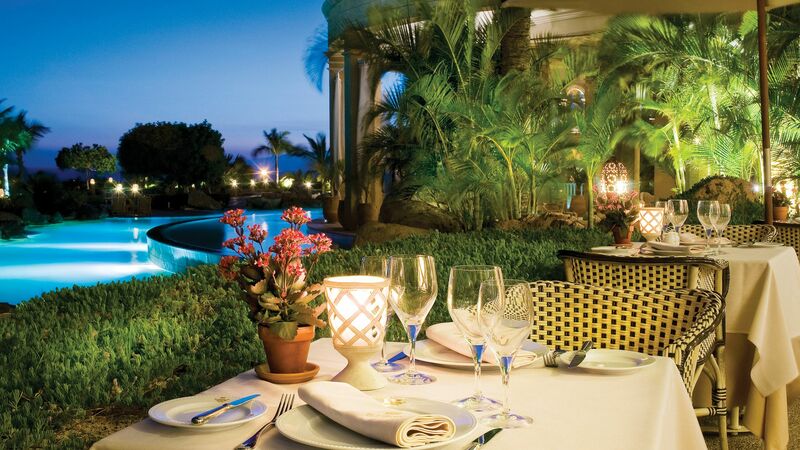 The hotel offers fantastic culinary experiences, with restaurants serving Mediterranean and Spanish cuisine where guests can enjoy tapas, refreshing smoothies or head to the poolside bar to enjoy piano music with a cocktail. The hotel does not accept guests under the age of 16. The hotel has 124 rooms, 6 floors, 2 lifts, ramps and a room which is completely adapted to people with reduced mobility. 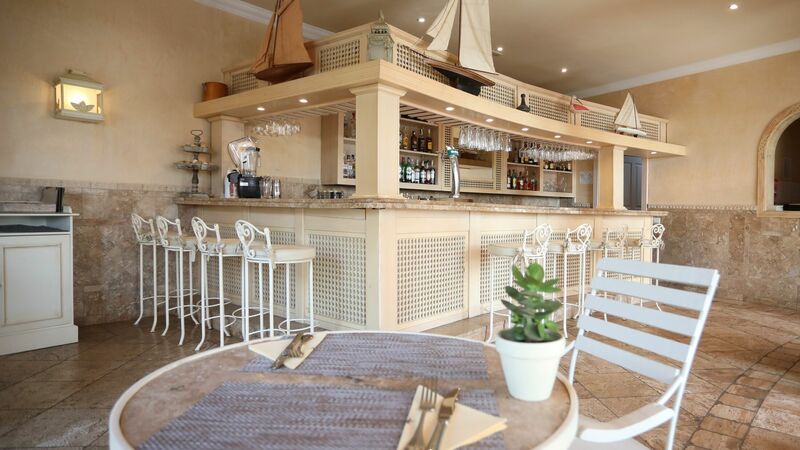 El Mirador boasts a lavish buffet serving international dishes with a Canarian touch. Guests can also enjoy watch expert chefs create delicious food at the show cooking stations. Guests on half board and bed and breakfast can dine here. 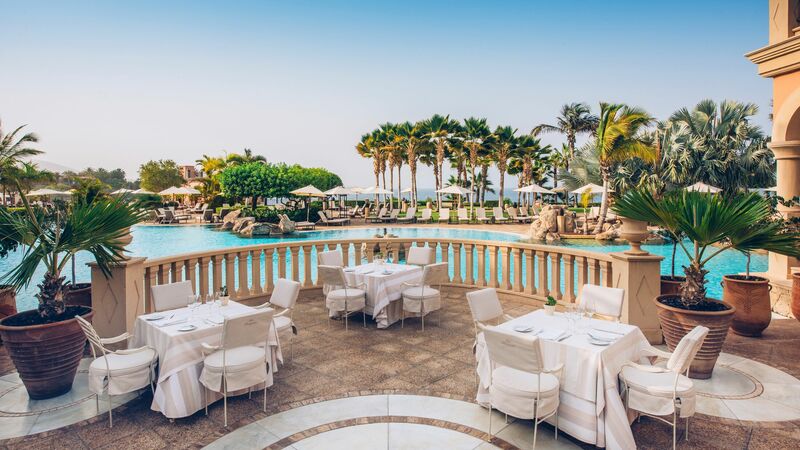 This poolside restaurant is the perfect spot to taste some of the finest Mediterranean dishes. 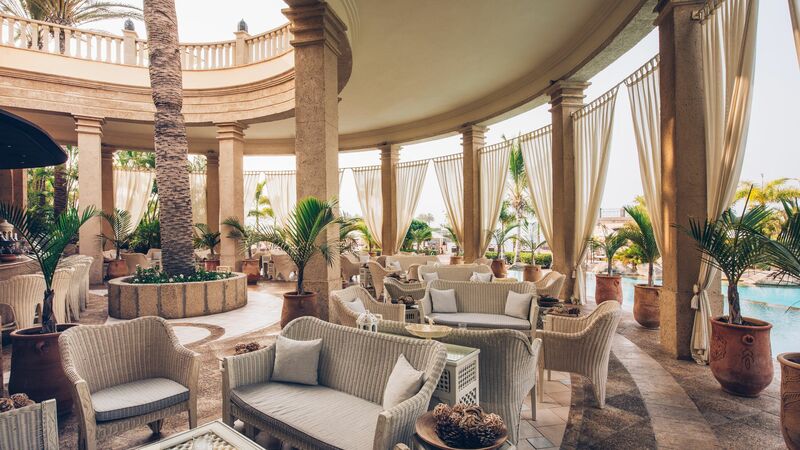 Enjoy the sea views while savouring tapas, meat dishes, or fresh seafood from La Pergola. Relax with a cocktail in this elegant poolside bar while enjoying beautiful piano music. This bar offers an extensive range of delicious snacks and refreshing smoothies throughout the day. Guests can relax around the expansive freshwater pool complex, which is spread out over more than an acre. Parasols and sun beds are available to use. The beautiful Playa del Duque beach is a 5 minute walk away, and is the perfect place to spend the afternoon relaxing by the Atlantic ocean. This comprehensive spa complex offers a complete sensory experience. 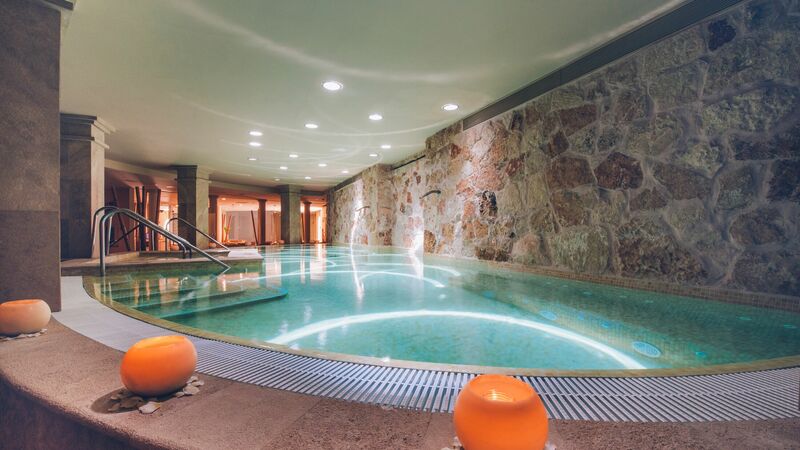 Take a dip in the hydrodynamic pool or choose from a range of luxury treatments, such as a hot stone massage or Turkish bath. 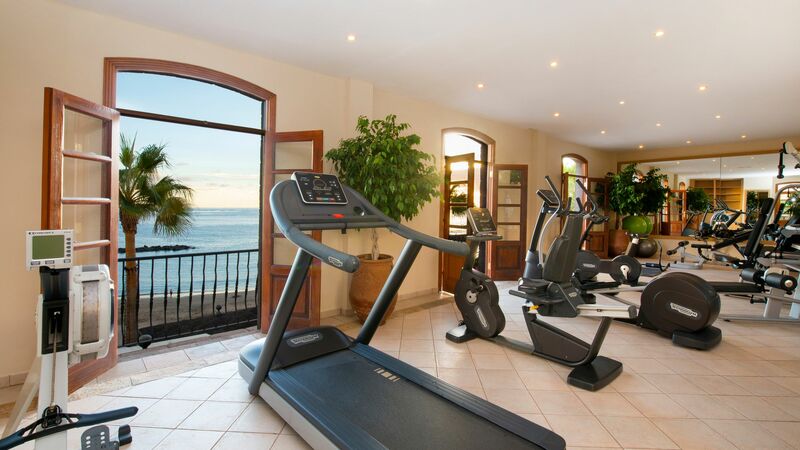 One of the best equipped fitness centres in Costa Adeje, guests can make use of the excellent facilities while enjoying views over the Atlantic Ocean. Iberostar Grand El Mirador is situated near five of the best golf courses in Tenerife. Golf enthusiasts will enjoy practising in the lavish green surroundings of Costa Adeje. Guests wanting to revitalise their body through Pilates can join group sessions or take a private class. From beginners to pro players, guests can practise squash in the hotel’s court, as well as borrowing equipment. Iberostar Grand El Mirador is located in Costa Adeje, close to the golden sands of the Blue Flag Playa el Duque beach. It’s ideally positioned for those wanting to spend their holidays simply relaxing on the beach or making the most of the beach bars, restaurants and cafés surrounding it. 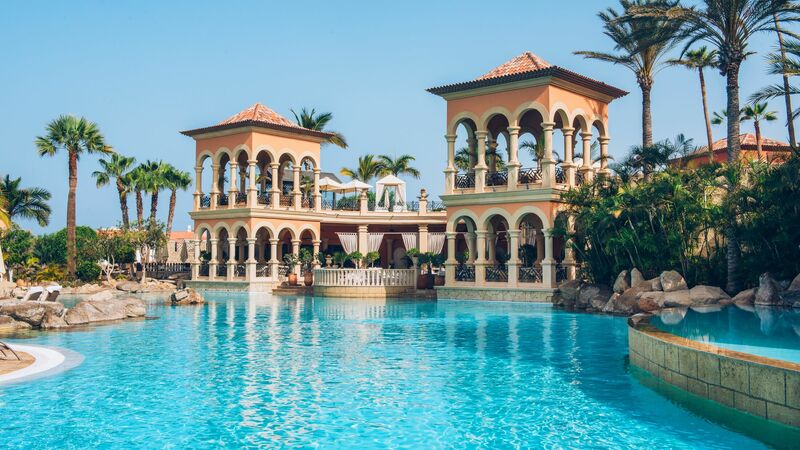 Costa Adeje has long been a favourite for celebrities and offers upmarket eateries, fine dining and chic bars, as well as designer shopping malls. It’s also an excellent spot for families, with a choice of two Water Parks, as well as water sports, horse riding, and lots more. Adults can enjoy serene spas or the professional standard golf course. Iberostar Grand El Mirador is a 15 minute drive from Tenerife South Airport. The Junior Suites are spacious and comfortable featuring a king-sized or twin beds with a separate dressing area as well as a spacious lounge. Junior Suites feature a king-sized or twin beds with separate dressing area and seating area. They have a balcony with fantastic views of the Atlantic Ocean. Suites have a 18m² fully furnished terrace to enjoy the views of the Atlantic Ocean. The suites have a spacious bedroom, lounge area, dressing room and bathroom with shower and bathtub. Junior Suites are located in a priority location and feature a king-sized or twin beds with separate dressing area and seating area. They have a balcony with great views towards the ocean. Located in the La Balconada VIP area, guests will receive complimentary entrance to Spa Sensations, traditional tea & coffee time in the afternoon, special attentions at the pool area, complimentary fruit, open bar and unlimited complimentary cava. Guests will also receive butler service, pillow and bed sheets menu, special attentions during stay, early check in or late check out (subject to availability) and tea & coffee making facilities in the room. A CD player and a DVD player is available for guests in a Junior Suite or Suite. The open bar within the VIP area is open 10:00 - 20:00. Guests who upgrade to La Balconada, the VIP area, will receive complimentary entrance to Spa Sensations, traditional tea & coffee time in the afternoon, special attentions at the pool area, complimentary fruit, open bar and unlimited complimentary cava. Guests upgrading to La Balconada in a Junior Suite Sea View or Suite Sea View will also receive butler service, pillow and bed sheets menu, special attentions during stay, early or late check out (subject to availability) and tea & coffee making facilities in the room. A CD player and a DVD player is available for guests in a Junior Suite or Suite. The open bar within the VIP area is open 10:00 - 20:00. Guest celebrating their honeymoon or gold/silver anniversary will receive a candlelit dinner for two (drinks not included), a room upgrade (subject to availability), one free entrance to the Spa circuit per person/stay, a bottle of sparkling wine and a welcome gift. Valid for holidays until 31 October 2019 staying a minimum of 5 nights. Honeymooners will need to present a copy of their marriage certificate upon arrival however this should not be older than 3 months. From our arrival until departure every request was attended to .Having visited the Mirador Hotel on previous occasions we selected this hotel as the centre piece for a special celebration. No member of staff failed to come up to expectations in fact our requirements were exceeded in all of the departments. Staff of particular note were , Guiseppe ( bar manager ), Davide front of house and catering manager ) Tiziana ( assistant to the Director who ensured that each day was more special than the previous ) Our well appointed bedroom suite was a sea view with every amenity and serviced to a high standard daily.The hotel has a beautiful pool area with semi private areas all of which are maintained by efficient staff . The 11.00a.m. complimentary cocktail is a welcome feature .We will definitely return soon. Had our honeymoon at the El Mirador and it was just amazing! The hotel, its view, the food, the room, just everything. Especially thanks to Tiziana Gomez and Marija Lazarevic (assistants of the hotel director) and Sara (our privat contact person). We can just recommend to take a room with sea view - its worth it. We enjoyed our stay despite the clouds! We were able to read and relax by the pool. It is a very quiet environment, away from the crowded, more touristy areas. We had a very large room, apparently a handicap access room. It was a bit far from the reception area and the hotel was not crowded so I was surprised we were given this room. It was a beautiful and clean room. The bed and pillows were very comfortable. All of the staff members were very friendly. The breakfast is fabulous-anything anyone from any country would ever want for breakfast! The Pergola restaurant was just okay. I recommend trying some of the other local restaurants for dinner. From the moment we arrived here it was obvious that guests were the priority and relaxing was the norm. A beautiful hotel and garden setting with everything you would need for a do nothing week. That said the hotel has immediate access onto the promenade which runs rights along the coast and offers a lovely walk, past beautiful restaurants and a lovely beech 2 minutes walk from the hotel. Just lovely. “ Don?? ?t hesitate book it.... Amazing ! Just back from a fabulous four nights, this hotel isn?? ?t just beautiful it?? ?s staff are all amazing too from the moment you arrive at security to the last second concierge put your bags in the taxi to leave, every single staff member go the extra mile without making you feel awkward. I have really no complaints, we ate in the buffet restaurant each night (because it was so good we didn?? ?t feel the need to try the a la carte) don?? ?t be put off by it being buffet, some mains are cooked to order just how you want them and delivered to you, the fillet steak was so so tender, breakfast really is as good as all the reviews say so!! A true 5* hotel and most importantly has 5* people working for them. Book it  You won?? ?t be disappointed.